Here is a list of come commonly asked questions; if you have any queries at all, please just complete our contact form and we will be in touch. What is the usual process for making a model? To start, all that we need is a PDB number or structure file and some ideas of colour and whether you would like mini-magnets to be included. We will provide you with some image designs and liaise until you are happy to give the go-ahead for printing. Each model we make is bespoke and takes about 20 working days from project start to delivery to your lab or office. The models are made using colour 3D printing and to a certain extent cost is based on the amount of material used. Changing scale has a significant impact on cost and we work with customers to select scales that will fit budgets while still communicating the information required. We hollow parts where possible to reduce costs. Finished models can be shipped to any UK, EU, US or international address. Who do you make models for? Our 3D models are for any university or Life Science business where students, colleagues or customers would benefit from getting hands-on with biological or biomedical structures. Our customers range from university researchers, PIs, Postdocs and PhD students to biotechnology, biomedical and pharmaceutical companies. Our models are used commercially as sales and marking tools and in academic settings for hands-on learning in lectures, practicals, demonstrations, research presentations, school and college visits, open days and science fairs. What 3D printing technology do you use? The models are made by 3D powder printing, with full colour. As standard these parts have a rough surface but we have developed a glossing technique that works well for organic shapes like molecular models. 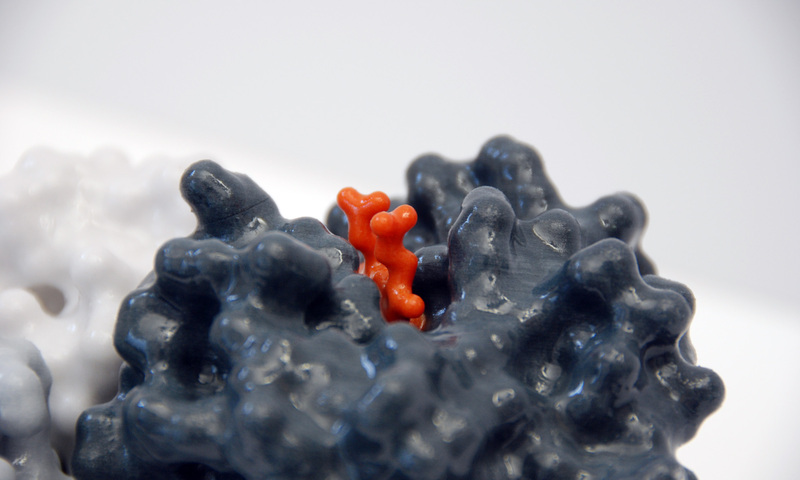 I don’t have a PDB code – can you still print my structure? Absolutely! We have a variety of ways to bring your data to life in 3D, so please just ask. Can you print ribbon, all-atom or cartoon views? These are less easy, but usually possible; molecules are usually best represented as continuous 3D surfaces, which are more robust when handled. Magnets – can these be included? Yes, we can incorporate mini-magnets into any model if you would like to demonstrate molecular interactions such as quaternary associations, ligand/drug-binding or subunit interactions. Scale – what size models can you produce? You can ask for almost any scaling factor for your molecule. Typically, most models are 6-7 million times life size, but we can print models up to 30 cm. For multiple models, we always scale these identically so they print at their correct relative real-life sizes.